Michael and Magic versus Kobe and LeBron? Sounds like a dream match up, and it could be coming to a video game console near you. 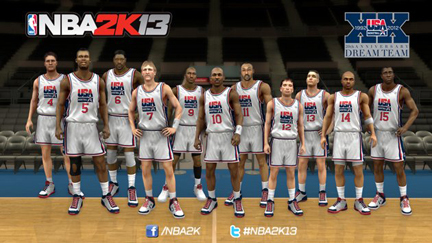 With USA Basketball and 2K Sports forming a partnership, fans can see what happens when the amazing 1992 Dream Team goes up against this year’s Olympic gold medal winner once NBA 2K13 hits the shelves this fall. Never mind that it’s not quite the real thing, more fuel is about to be added to the debate. Not that there really is a debate in Michael Jordan’s mind. It’s hard to argue, considering the 1992 Dream Team had Jordan, Magic Johnson and Larry Bird leading a group that is widely considered the greatest collection of talent ever assembled. That team included 11 future Hall of Famers, won its six Olympic games by an average of more than 43 points en route to the gold medal and never was challenged the way this year’s team was by Spain in the gold medal game, with the Americans squeezing out a 107-100 victory. Then again, that’s a testament to the global growth of the sport that the 1992 team spurred, leading to an influx of foreign talent in the NBA. The ’92 team boasted arguably the greatest player of all time in Jordan and greatest point guard in Magic Johnson, not to mention Larry Bird and dominant centers in Patrick Ewing and David Robinson. If the most recent group had a weakness, it was in the middle, with Dwight Howard, Chris Bosh and Blake Griffin sitting out with injuries. Throw in the fact that Dwyane Wade and Derrick Rose missed the games, too, and the Americans weren't quite fully loaded. Still, they brought plenty of ammunition to London, with LeBron James, Kevin Durant and Bryant leading the way. And even with some stars missing, there still was talk that this year’s team could be as good as the one that stormed through Barcelona two decades earlier. Bryant fueled the debate when he told reporters during training in Las Vegas they could take a game from the 1992 team if they met in their primes. Even though Bryant didn’t say the current stars would win a series, the comment drew sharp replies from members of the 1992 team. Jordan told The Associated Press back then that he “absolutely laughed” and said there’s “no comparison” which team is better. This time, he wasn’t quite as blunt. “I just felt like we had enough size that we could contend with the 2012 team,” Jordan said. “I think one of the things the 2012 team lacked was size. We probably would have attacked them from inside and outside, and our defense would have been pretty much solidified with the shot-blockers as well as perimeter defensive players. There’s no way to know for sure, of course. There’s no time machine that can transport the 1992 team to today or the 2012 team back 20 years, so the video game might be the next best thing. If nothing else, it’ll give the debate another platform once the game is released on Oct. 2. The idea of seeing Jordan going against Kobe or James should intrigue fans, even if they’re the ones at the controls and the players are in graphic form. Right? The numbers indicate they would. Jason Argent, 2K Sports’ vice president of marketing, said he didn’t have the online statistics but the company sold about 5.5 million units of the 2K11 game, and another 4 million units for the 2K12 game, which was impacted by last season’s NBA lockout lockout. Even so, the company wasn’t planning to include the 1992 and 2012 U.S. teams. He said Jay-Z provided the push. The rapper and part-owner of the Brooklyn Nets is serving as the game’s executive producer, and he insisted in a meeting that those Olympic teams be included. He also helped get Charles Barkley to sign on and be included. “He put in a call to Charles, himself, and helped us work an agreement to use him in the game,” Argent said. One player who won’t be represented in the game is Scottie Pippen. Argent said they simply couldn’t reach an agreement. As for which team was better — 1992 or 2012? Jordan thinks it’s just beginning.